On April 26, 2018, the University of Limerick (UL) hosted tekom Europe’s annual European Academic Colloquium on Technical Communication. The colloquium gives researchers, educators, students and specialists from different industries the opportunity to discuss the present and future of user assistance, and how they will affect the next generation of technical communicators. As one of the few universities in Ireland that offers dedicated courses on Technical Communication, engagement with industry is central to UL. To assist in that venture, Rachael Hewetson and the User Assistance (UA) Content Services team in Galway have been liaising closely with UL for many years, offering insights into the industry perspective to students and educators. ’We started visiting UL as part of an annual recruitment drive in 2005, with many UL graduates joining SAP both here in Ireland and abroad. This has grown into a steady collaboration and sharing of knowledge’, Rachael says. This contact between the UA team at SAP in Galway and UL has grown steadily over time. For several years now, the UA team has delivered a workshop on “A Day in the Life of a User Assistance Developer at SAP”. Rachael believes this workshop benefits students by providing them with the chance to learn how the UA team applies technical writing theory in the real world of agile software development, the skills the team needs to handle virtual and global teamwork, and how the team overcomes the challenges of continuous delivery of UA for cloud software. Rachael has also participated in interdisciplinary forums hosted by UL, for example a workshop last year entitled European Studies in Ireland: Perspectives for Third Level. By working collaboratively with academia, the UA team has the opportunity to represent the interests of a wide variety of lines of business across SAP in terms of their requirements for team members with excellent linguistic abilities. 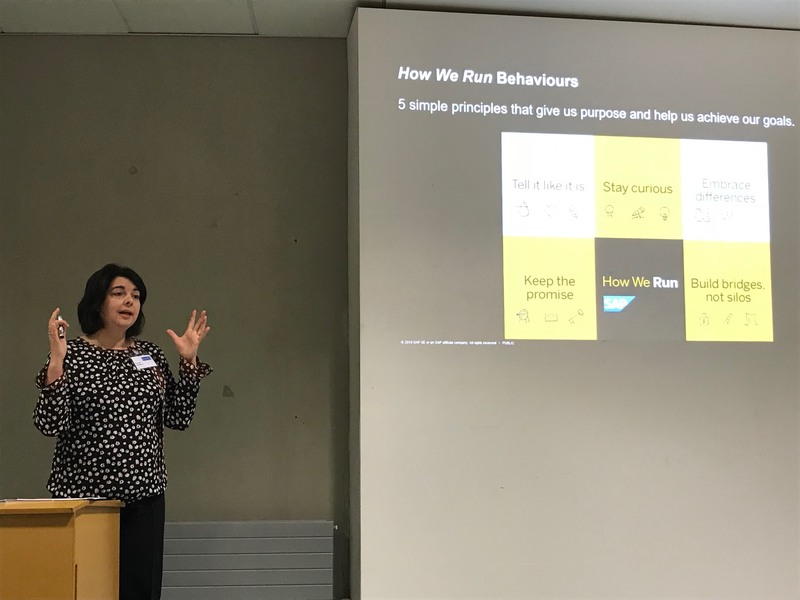 ‘All these interactions give us a fantastic opportunity to share industry requirements with these third level institutions, so they can cater for them in their curricula and ensure a steady and high-quality pipeline of talent into the workforce in general, and into companies like SAP’, Rachael says. This year’s participation in the colloquium has been another step on this collaborative journey, giving Rachael a platform to deliver a key note on the skills and competencies that SAP looks for in team members, and give the audience a flavour of what will be needed in the near future. The information provided that day will also be included in a Europe-wide initiative by TecCOMFrame – a project involving eight higher education institutes across Europe who are aiming to develop a common academic qualification and competence framework for technical communication.